March 16, 2018. 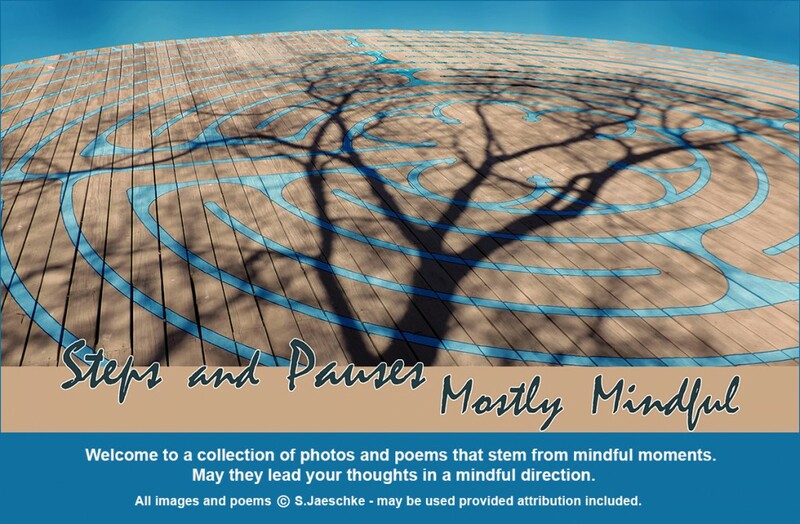 This poem emerged while studying Zen poets – mostly male, but one female poet made the syllabus. Otagaki Rengetsu (1791–1875) became a Japanese Buddhist nun and one of the country’s most respected female artists – combining her poetry, calligraphy, and pottery. She learned from Kyoto potters and decorated her rough and rugged bowls, cups, and other vessels with her poetry, either painted on or scored into the clay in flowing calligraphy. Orders from tea masters and others kept her very busy. This collage of found images shows both her pottery and calligraphy styles. February 9, 2017. My inner poet and inner photographer often trip over one another vying for best view of current circumstances. Sometimes they work in cahoots. This week’s WordPress Photo Challenge “Shadow” sent me scurrying through files for a specific cahoots – on Austin’s Town Lake Labyrinth, October 2007. One of many savored labyrinth walks, this day pops instantly to mind periodically – a serious reminder to not take myself so seriously. January 22, 2017. Each year (for seven years now) I concentrate in Nov/Dec on connections, intentions, directions for the coming calendar year. I do this in a group led by Janet Conner (janetconner.com) tagged “The Lotus and the Lily”. Janet’s book by that title shows one of my earlier mandalas. A multi-step process, each year revealing more. The mandala changes year to year, evolving to reflect both my growth and changing surrounding influences. Initially termed intention mandalas, Janet now calls them invitation mandalas; I consider mine a contract with Spirit. Background, a foot bridge into foggy unfamiliar territory: this is specific to 2017 US upheaval (beyond my control) – I will Step Forward across that bridge into the fog. August 16, 2016. More reflections from recent Gathering Of Circles (more at Gathering Of Circles on FaceBook). In 2003, my first experience of GOC included a strong call to create a labyrinth! Located in the Lincoln National Forest, the protocol is “leave nothing, take only pictures”. My challenge was to find a weather-proof, terrain-adaptable portable labyrinth. Back home, gears turning, I improvised a “ribbons” labyrinth that fit into a duffel bag, thus fit into limited car space for transport. Ribbons are harness material from an equine supply – extremely durable for years of use. In 2004, laying the labyrinth put me down on my knees alone on Mother Earth, for eight hours. Phenomenal experience. Subsequent years, the laying went a little faster, but always a ritual of focus and endurance. Time I savor still. But I got older, less flexible, and had to stop laying the labyrinth. I missed it. Others missed it. And last year, I agreed to pass the materials to younger hands. This year Chris and Christine spread the ribbons, created the familiar path in a new location – beginning anew. My first walk was soon after sunrise, new light shimmering, ribbons inviting! May 8, 2016. Yesterday, while listening to wisdom about ways to encourage transcendent experiences, I found myself writing this poem in the margin of my notes. One of the suggestions was ritual. My thoughts went immediately to the daily morning routine with our Labrador. Where better to “wake up” than outdoors just before dawn? Ritual happens.